The Patented Portable FootFidget® Foot Rest is a revolutionary concept that provides the same energy releasing, focus attaining results that therapists have gained by using hand fidgets for years. It provides these same positive results but leaves hands free for classroom work. The Portable FootFidget® can be used wherever your student goes- at school or at home. 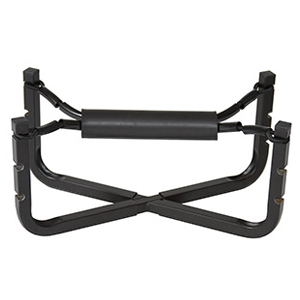 The Portable FootFidget® Foot Rest includes a FootFidget® on a lightweight metal stand. The stand is notched to provide adjust-ability for comfortable ergonomically correct positioning dependent on the user’s height. The Portable FootFidget® Foot Rest will provide an energy releasing activity, as well as improving the students focus and posture.